The Crewzers HQ Playset from Golden Bear is the perfect accessory for all Go MINI Crewzers fans. 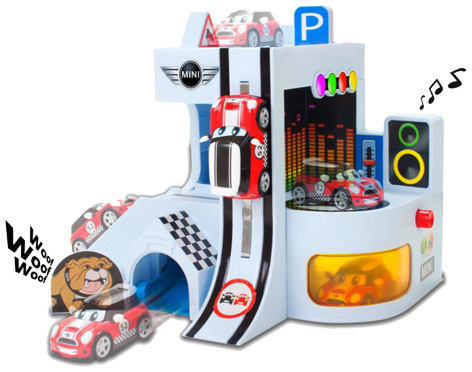 Packed full of exciting features, it has an amazing three levels, each with a unique play feature. The rooftop parking escape chute provides a fast getaway onto the street, and provides a ‘woof’ sound as the car breaks through the closed doorway. The middle level turntable is perfect for demonstrating the best donut spins! Music and flashing lights are also incorporated into this fantastic stunt zone. A high speed vertical staircase is mounted on the front of the Crewzers HQ, whilst the ground floor car showroom also includes a repair garage. One Crewzers vehicle is included in the pack together with a set of stickers for ultimate customisation. Extra Go MINI Crewzers cars can be bought separately, and include models with imaginative names like Jaxx, Sparks, Flame, Dash, Pace and Slix. Please tell us what you think of the Crewzers HQ Playset by Go MINI and Golden Bear.